Prehistorical or mythological themes also figure occasionally in republican murals, as in a mural painted in Lenadoon Avenue, West Belfast, in the summer of 1996. 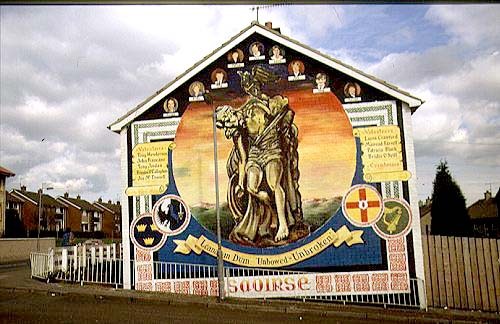 It depicts the dying warrior Cú Chulainn as the central figure in a mural commemorating Irish Republican Army (IRA) members from the local area who have been killed. Cú Chulainn is depicted, as in the 8th century epic tale Táin Bó Cuailnge, dying upright.